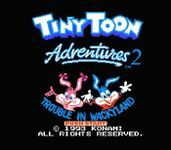 Tiny Toon Adventures 2: Trouble in Wackyland is a Tiny Toon Adventures-based game, released on the Nintendo Entertainment System in 1993, and developed and published by Konami. According to the story there is a new amusement park in Acme Acres, and everyone has been invited to visit by a "Secret Admirer". There are five areas which the player can explore, each one starring a different character. Plucky is in charge of a bumper car. Hamton tackles a tricky train trip. Babs is the sole passenger on the rollercoaster. Furrball dodges Sweetie as he goes for a wild log ride. And Buster bravely faces the thrills and chills of the Funhouse. Each ride costs a certain amount of tickets, but as the player racks up points on the various rides, more tickets are earned. Eventually, when enough tickets have been earned, they can be saved until the player has enough to afford the entrance fee to the Funhouse, where Buster Bunny must then navigate numerous obstacles before squaring off with the "Secret Admirer", who turns out to be Montana Max. Just like in the first game, Roddy Rat is there to try and interfere, along with other "villain" characters. Other Tiny Toon characters also make appearances in varying degrees.